Jamie Williams Design create beautiful handmade and hand painted kitchens in Cheltenham, UK. Our kitchens are built with utility in mind using the finest and most durable materials. Our 'client lead philosophy' continues into our bespoke kitchens. We are not bound by a particular range or style, instead we will approach your kitchen project with the intention of tailoring everything to suit you. We of course have a keen design eye on what we think works well in the available space, and our detailed design process allows each and every client to explore all ideas and possibilities. Our bespoke kitchens are handcrafted in our Cheltenham workshop. As a close knit team, we are committed and dedicated to ensuring that every aspect of your kitchen is of the highest possible quality. We use only the finest natural materials and we source our hardwoods from FSC suppliers. All of our craftsmen work closely together to create a kitchen that flows from the worktops and appliances, through to the larder and pantry. At Jamie Williams Design, we curate the whole experience of designing a kitchen made for each and every clients needs and wishes. From design inspiration right through to the installation, every member of the team maintains the diligence and passion that is essential to producing a beautiful result. We're not here to tell you what you want, this is your kitchen and your ideas. At Jamie Williams Design we have the technical know how and over 20 years of experience to tell you what will work with the space you have and what won't. Everything else is up to you and with our range of contacts when it comes to materials, appliances and paints, your kitchen can be exactly how you want it. 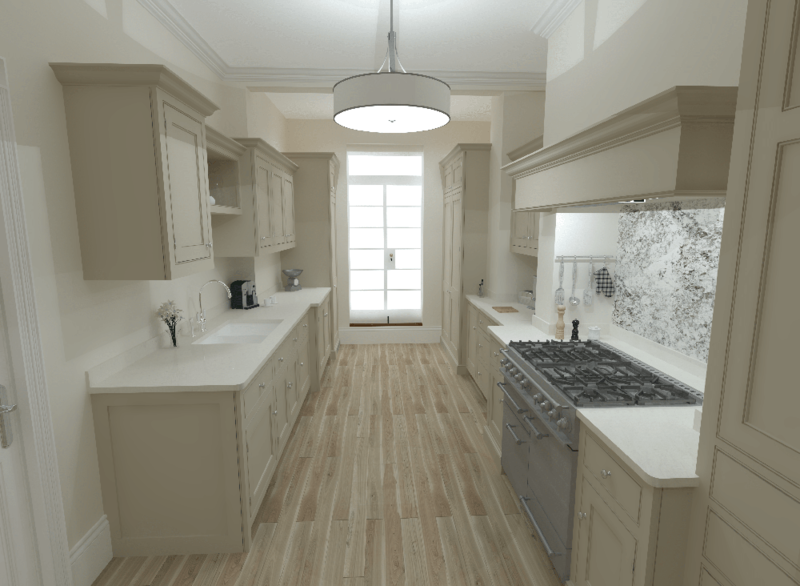 Our state of the art computer aided design is the perfect way to progress to your finished bespoke kitchen. 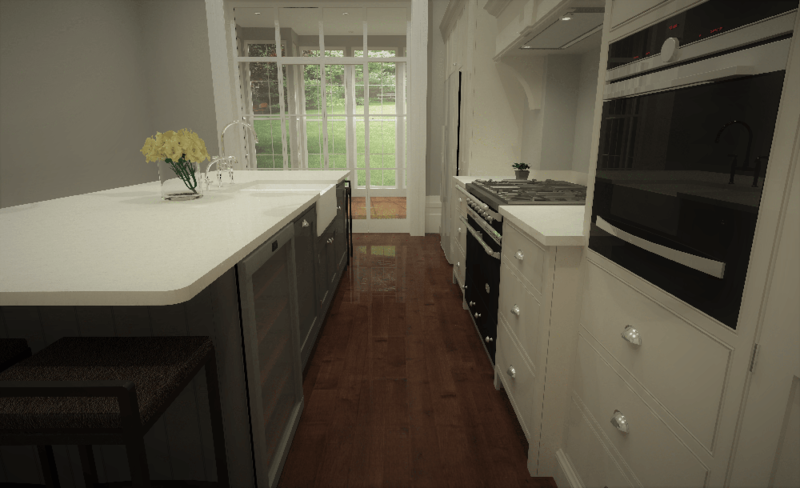 Our expert CAD designer knows exactly how to transform your ideas into a digital reality so you can see the kitchen go from your mind to something you can see. It's also a great way to see how the space of your room is filled and how the kitchen flows from different rooms. Our kitchens are beautiful, there's no denying it, inside and out, from exquisite dovetail joints to our traditional solid in-frame door design, Jamie Williams Design kitchens exude luxury and quality from any angle. All our kitchens come with a lifetime guarantee. Our installation team have years of experience fitting kitchens and have learnt to overcome problems that come from period and listed buildings. Why not book a consultation or visit our showroom and we'll let our craftsmanship do the talking.